The annual YPN competition was initiated and created by its artistic director, Marika Meshkuna-Slater, in 2008. It offers international stage, access to world class expertise and a platform for communications and exchange to young talented pianists of the world as well as piano teachers, parents and a wider community. The competition promotes and develops experience, learning, international communication and the pursuit of excellence and joy through and in music. YPN is the first and only classical international competition in the history of the North East. It is also the first and only international competition for this age group in the UK. YPN is entirely independent and free from affiliation with any organisation or institution. Its work is only possible through charitable donations and due to the dedication of, and input from its advisors, jurors and friends. In 2013 YPN won the prestigious national Music Teachers Award as “an outstanding initiative and for the excellence of its educational programme” – the accolade usually awarded to educational institutions and organisations. Following studies at the Em.Darzinsh Specialist Music School for gifted children, Marika Slater obtained Diploma with Distinction in concert performance, concert accompaniment and piano pedagogy from the Latvia J. Vitols State Conservatoire. Some years later she completed the postgraduate course in concert performance at the conservatoire. The winner of the S. Rachmaninov State Piano competition, she extensively performed as a soloist and a chamber musician in Latvia and abroad – in France, Denmark, Finland, Spain, Poland, the USA, Russia, and regularly recorded for radio and television. A recipient of several international scholarships, she attended summer academies and masterclasses, including harpsichord summer schools in Belgium and Hungary. Invited to take the position of a lecturer while still a student, for over 20 years Marika taught at the Latvia State Conservatoire (now Latvian Academy of Music) and its affiliated Em. Darzinsh Specialist Music School. During those years she initiated many international projects, including the first international piano masterclass in Latvia, with Latvian professors, Jurmala-95. Upon her move to the UK in 1996, she held a piano class at the Sage Weekend Music School and for many years taught at the Royal Conservatoire of Scotland. Currently Marika Slater teaches young pianists at the Royal Birmingham Conservatoire. She serves on the juries of several international piano competitions, chairs the jury at the Young Pianist of the North competition and delivers piano workshops and masterclasses. Marika is the founder of the PianoKids studio, the only provider of the specialist piano tuition in the North East of England, and now in Bristol, for musically gifted children and advanced piano students. Her pupils regularly win top awards in national and international competitions and festivals. Two pupils were among the 100 nationally selected best young pianist to perform with Lang Lang in London in 2011. 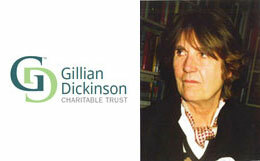 The funding from the Gillian Dickinson Trust, a local North East charity, has been instrumental in establishing the competition and allowing it to bring to the region the world-class expertise, talent and opportunities, readily available in many other countries and areas of the UK, and put the North East on the international map. All future development and success of YPN will be built upon the firm base, provided in its crucial early years by the Trust. The PianoforteNorth Foundation is a North East charity established with the purpose of holding musical, educational and pedagogical activities.